About a year ago, the phrase “Internet of Things” kept coming up in conversations I had at Mozilla. The Internet of Things (IoT) is a network of physical objects and services that sense the environment around them and exchange data over the internet. At Mozilla’s Hive Chattanooga, we thought it would be fun to find ways of combining IoT with the high-speed internet we have in town along with education, which is our passion. Once the idea was born, we approached an incredible local partner, The Company Lab (CoLab), about collaborating with them on a local event, and suddenly the 48Hour Launch IoT Edition was born! 48Hour Launch (48HL) is a weekend-long competition that challenges teams of entrepreneurs and specialists to transform a startup concept into a viable business model, prototype, policy proposal, or piece of curriculum. 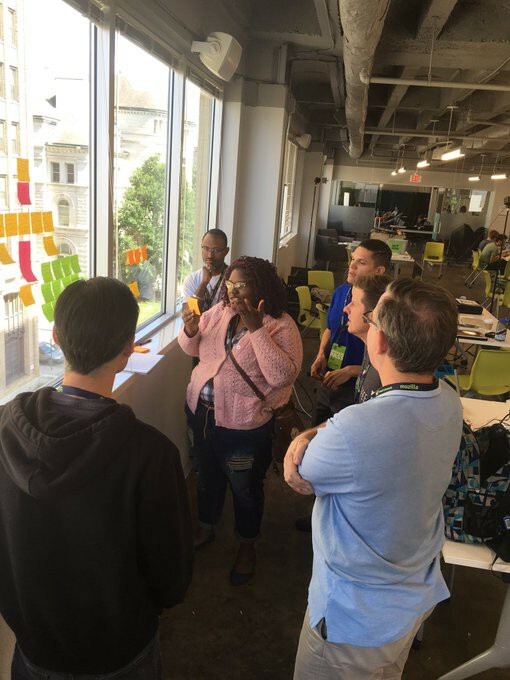 We asked folks across Mozilla if they would mentor these local teams and share their skills with our neighbors in Chattanooga. I had the unique position of representing Mozilla’s work in Chattanooga with our mentor cohort as well as representing Mozilla to our local partner. The Company Lab planned, organized and hosted the event itself while I worked with our Mozilla convenings team to develop our mentor cohort journey. Met one on one with each mentor to hear about their vision for joining the cohort. Led a call for group introductions and discussions before the weekend with the cohort. Wrote blogs leading up to the event, sharing Mozilla’s interest and participation in 48HL. Had weekly planning meetings with Co.Lab leading up to the event to keep clear communication between both partners. We learned a ton in the months leading up to the 48Hour Launch, as well as throughout the weekend itself. Our mentors’ contributions to one another and to the local event were incredible! They came ready to give and dive into the work being done throughout the weekend. Additionally, balancing so many details on both sides – with the mentors and with Co.Lab, there could have been misfires but they culminated into an incredible collaboration within and outside Mozilla for a fantastic local event. Partnered events can amplify and spread local work across a global network of likeminded people working to protect internet health and users’ rights. Looking ahead, we didn’t want to lose momentum with what we’ve learned as well as what opportunities this new cohort (and others) could add to local events. To that end, we’ve begun co-planning another local event built on the Chattanooga 48HL model. This January, we’ll be sending Mozilla mentors to the SPARK youth hackathon hosted by St. Anne’s-Belfield School (STAB) in Charlottesville, VA.
I’ve teamed up with Chad Sansing, a curriculum developer at Mozilla, and Kim Wilkens, a local school computer science coordinator and SPARK organizer, to pass along the lessons I learned from our 48HL event. We want to build off what went well and avoid repeating what didn’t go so well. For example, we’ll continue working with our mentors to make sure the experience is valuable for them and we’ll continue to send mentors from a wide variety of backgrounds to support local hackathon participants in areas like coding, design, and project management. However, we’ll also work with STAB to make SPARK a collaborative event; as we believe that not every hackathon should be a competition or winner-takes-all affair. As Chad and I anticipate the SPARK weekend, we’re excited to be refining the mentorship and cross-team collaboration process within Mozilla. Later this spring, we hope to iterate on it again at another local IoT event. Let us know if you’re interested in learning more and tell us how you think we might improve the work!